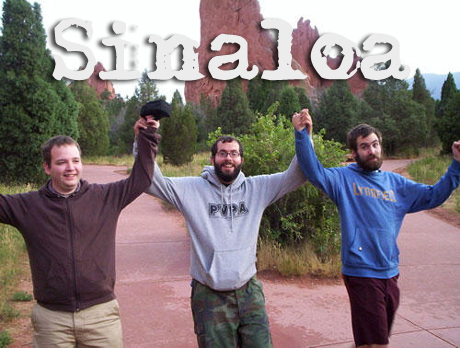 For over five years now Sinaloa have been making a name for themselves in the basements of North America. This year has seen them bring their distinctive brand of emotionally driven guitar music to Europe for the first time, simultaneously inspiring and entertaining along the way. For all the grumpy old bastards who complain that music doesn't have any drive, any passion, any heart anymore, I want to point them in Sinaloa's way. Scene Point Blank: Can you start by introducing yourselves? What do you do in and outside of the band? 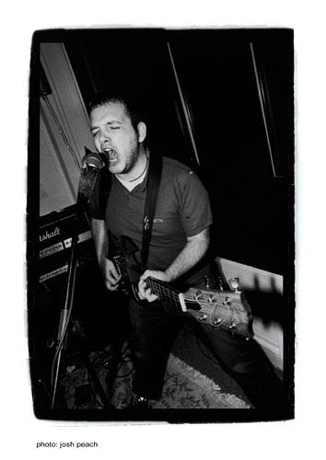 Luke: Pete and Brendan are the guitar players, and are responsible for most of the vocals. Pete is a teacher, grooming youngsters for success, and he also puts out records under Moganono. Brendan works in IT security, wears a tie to work ... bosses people around. Brendan does a lot of graphic design outside of work. My name is Luke. I play drums, and I work for an environmental company - profiling hazardous waste. I also play acoustic music under the name The Nine Billion Names of God. Scene Point Blank: How was the European tour with Ampere? This was your first time over, how did you find it? How did you find life/ the DIY scene differed from in the USA? Luke: There were a lot of positive forces coming together for that trip. First, we were spending another two weeks traveling with our friends Ampere, just like we had done last summer (in the U.S.). Also, we were getting to do that while seeing Europe for the first time. It was a combination of comfort/ familiarity with something wildly new and exciting. There were many things that were obviously different about touring in Europe. People were less afraid to show real genuine excitement about music, and what people were doing, as bands/with music. 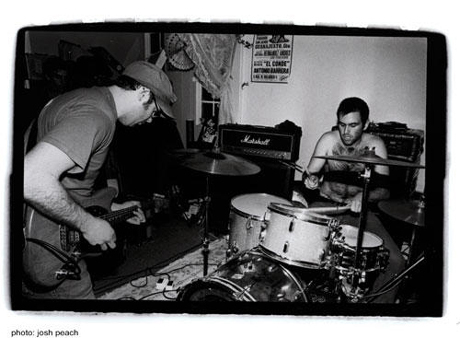 One aspect of the U.S. DIY scene that, although often subtly, shows itself is that people seem to feel like they have to be guarded, and filter their outward appearances. That usually is manifested in a general cynicism of almost everything. In Europe, people seemed to more open, and wouldn't filter anything. There were also the nuts and bolts differences of type of venue (more established spaces/ squats Vs. U.S. having more basement-type shows), accommodation (having dinner/ breakfast prepared, having a driver), etc... Even with all of that, though, I was still struck by the similarity between most of the kids we met that were involved in the DIY scene in Europe and the kids we've come across in the U.S. Styles and approaches to â€˜punk' do differ, but the overall spirit and ideals seem to be largely the same. I actually found it to be very comforting and positive that there were globally consistent ideals in punk/ DIY communities. Scene Point Blank: Obviously you were playing with Ampere every night, but of the countless number of local bands you played with was there any that really stood out? Recommendations please! Luke: We were fortunate to be able to play with a lot of good bands. Good people playing good music. Pete the Pirate Squid (Germany), Narwhal (England), Daitro (France), and Baron Noir (France) stand out in my memory, both for playing good music and for being very friendly. Pete: Along with those bands I also enjoyed watching The Mock Heroic (UK). Scene Point Blank: Has touring with Ampere affected the way you yourselves play/ perform? Luke: I don't think there has been an obvious or glaring change in how we approach playing, but I think there probably have been subtle things. When you're playing with a great band, who you respect very much, every night, you really want to try to match their intensity and effort. You get over feeling tired when you know that Ampere is going to play a blistering set either before or after you play. Brendan and Pete could probably learn how to do some sick jumps, by watching Will. Scene Point Blank: What's the writing process like for you guys? Lyrically, does everyone play a part in each song or is it a case you write songs separately then pull everything together at a later date? Luke: Generally, two things happen at the same time during song writing for us. We get together and make noise, put parts together, and make music that feels good and complete. All three of us, separately, work on writing lyrics that we want to be able to express, through the band. We all write things, and then figure out whose words fit best with which piece of music, both practically (song length, etc) and for mood. There is generally quite a bit of conference when we are trying to best mould the words to the music (or vice versa), and we all make sure that each of us are comfortable with the ideas being expressed, lyrically, but there isn't really any censorship of anyone else's words. I think that is mostly due to the three of us, generally, wanting to express similar things. Scene Point Blank: And the recording itself? Is everything meticulously recorded separately or is it submitted to tape while you play the song(s) through? Luke: Our most recent recording (split with Ampere) was recorded live, with all three of us playing the songs together in a room. We wanted to try to let the energy of playing together to show up on the recording. Before that, we didn't really feel that we had enough mastery of songs, and our instruments, to get good takes, for each person, at the same time. So, for Fathers and Sons and Footprints on Floorboards, things were tracked out separately. Both approaches had positive aspects, and we're pretty open to trying new things if we think it will bring out something good. I wouldn't say that we are meticulous with recording, and will sometimes overlook some flaws if the right feeling was expressed, but we keep at things until all three of us are happy with everything. We work with a one-person veto, so if anyone of the three of us isn't happy with something, we do it again (even if the other two loved it). Scene Point Blank: The use of stand up bass and trombone on Footprints on Floorboards really added to their respective songs. Can we expect further collaborations in the future? Luke: I hope so. Not only did that sound great to us, but also it allowed us to bring some other friends in to add their skills to what we were doing. We have some very talented friends, and are ecstatic when they want to join in the process with us. Scene Point Blank: Something that marks you out from most other bands is your inclusion of explanations along with your lyrics to every song. What prompted you to do this? Luke: It's funny, but I don't really remember any real discussion, at the beginning, as to whether to include explanations of songs. Because of the respect and love we had for our good friends' band Anton Bordman, who taught us a lot about what a band could do, and what a band could say, it just seemed natural for us to follow some of the aspects of the model they provided â€“ including explanations. We put a lot of effort into writing lyrics, and we think it's important to have something to say, in each song. Taking the time to explain things, while useful to anyone reading them who wants to know the reason behind the songs, also forces us to focus on what we are trying to say. Scene Point Blank: The new record with Ampere is fantastic, and not the first time you've done a split with a great band. If you could do a split with any band, old or new, who would it be and why? Luke: Wow, what a question, and so many different answers, with so many different reasons. We've always approached split recordings as a way to express friendship or kinship with bands that we know, love, and respect. So, it would be hard to pick some band that we all loved, but didn't know, or didn't have a friendship with. I think splits should generally express some sort of relationship or shared experience. Given that framework, my choice for an old band would be Anton Bordman, and my choice for a new band would be Tiny Hawks. Scene Point Blank: I really like the pro-active message in the new song "Expect Delays". Do you think that now with Bush in his second term it's more important that ever for people to get motivated and try to change some things? Luke: I'll have Pete jump in, to answer these two questions, since he wrote the words to these two songs. Pete: I think it is always important that people try and stay pro-active in everything they do. Unfortunately, we tend to not always follow through in this area... maybe it is inherent to human nature. At times it can be overwhelming to try and figure out what we each can do to stay active, or how to pick an area so that you can really focus on it and try to accomplish some goals. At this point in our country we have had pretty much the same with our government, if not worse (and I tend to feel it has been worse actually). We are still stuck in a war, gas prices are insane, millions are homeless and unemployed - it's daunting and I don't think I have any answers, I'm not sure there are any answers right now. We just need to stay active, because it might be all that will save us, and it is the only way we can expect to make some change in our lifetime. Scene Point Blank: The story behind the song "November's Unanswered Questions" is ultimately quite a reassuring one. Do you ever find it hard to stay positive with things the way they are in the world at the moment? Pete: I think we all get frustrated at times. It's so easy to complain, and there is a lot of things going on in the world that need to be changed. At some point everyone needs to vent, I guess you just need to find a balance and make sure that is not all you are doing in your life. It is very reassuring when you find like minded people, or see people doing wonderful things in their own lives that are truly inspiring, whether it be political or not. I think I find this in those I surround myself with and finding inspiration in them and what they do. Scene Point Blank: What's your view of bands like Anti- Flag who espouse anti-corporate rhetoric while being financed by a company like Sony? Do the ends justify the means? Luke: Ultimately, I think people are allowed to use their art/ ideas in the way that they decide is best. So, my general answer to your question would be that, if that particular band decided that they thought the end justified the means, then they would be making the correct choice. However, a lot of bands seem to start out with the intention of using the mechanizations of broad exposure to bring positive/ enlightened ideas to people who wouldn't otherwise be exposed to them, and then devolve into a state of enjoying the adoration/ money/ etc., while forgetting what they originally intended to do with it. I think that it's kind of funny that I bristle at the thought of â€˜punk' bands becoming big famous stars, but tend to get excited when big established, and decidedly un-punk, stars say something remotely radical. For example, if Jay Z was on MTV and went on an anti-Bush rant, I would probably do a back flip with joy. However, if some band like Against Me! (since they seem to be a lightning rod) was on MTV giving the same rant, I might just wonder what the hell they were doing on MTV. I think punk kids, myself included, sometimes face a conflict between big ideas/ ideals/ morality and our wanting to own our scenes/ bands/ art, and keep them our own. I don't think those things always need to draw us in opposing directions, but recognize that they sometimes do. Scene Point Blank: All profits from the sale of copies of Footprints on Floorboards were donated to the Sheila Brodie Zetlan Breast Cancer Foundations. What made you chose to donate to this particular organization/ cause? Luke: This foundation is one that was started by Pete's family, in memory of his mother. They've raised a lot of money, over the years, to be put towards Breast Cancer research. I'll let Pete add to this. Pete: When it came time to decide about donating the money we brainstormed a few ideas, but ultimately I think we wanted to try and find an organization that we were a bit familiar with and had some connection with. There are so many out there to choose from. I mentioned to Brendan and Luke that our organization was always an option, but I did not want them to feel that we had to use it or make them feel awkward or pressured into doing it if they had some different ideas. However, in the end, this one seemed to make the most sense to us. We started the foundation after my mother passed away from her battle with breast cancer. Initially, we put together a road race as a fundraiser. This lasted for many years. After that we organized a three-day music festival for a few years. When that ended the organization had been a bit dormant in that we have not organized another fundraiser since then. So, again, it made sense to put any profit towards the organization. Cancer, whether it be Breast Cancer or not, is something that has and will affect us all in our lifetimes. It is a scary disease, one that I care not to see again or have anyone else go through that pain and suffering. Scene Point Blank: I doubt all record labels would be terribly happy about giving all profits from a record away. Waking doesn't come across like most labels though, and the two of you seem very much in sink. What is your relationship with them and how did it come about? Luke: Actually, the great idea of donating the money came from Evan (Waking Records), so it was a case of a label championing righteousness over some bottom line, or profit. I agree that our band and Evan's label do approach punk, and other things, in similar ways. I think we both agree on what music and art should accomplish, and how it should be accomplished. It was actually those similarities, I think, that led us to become friends with Evan, and the â€˜business' relationship really just came from the friendship. Scene Point Blank: How essential are beards to your band? Luke: I would love to say that beards are vital to all aspects of the band, but I shaved mine when I got back from Europe, as did Brendan. Pete is keeping us honest, and on the cutting edge of punk fashion, by continuing to stay furry-faced, though. I like beards, but I like big changes more. Grow a burly beard, get bored and shave it, and then grow one again - a pattern I've been in for a while. Anyway, I think we're still on solid ground, as a band, with or without whiskers. Scene Point Blank: How do you see Sinaloa as progressing? Is the band something you see as ongoing or something with a very definite start and stop point? Luke: Man, I have a goal to be playing in this band, in some dank basement, when I'm 60 or 70. We're getting fairly old, already, relative to a lot of kids in other bands, or kids going to shows, and we all have a lot of â€˜adult' things like jobs and relationships that sometimes make it difficult to spend all of our time and energy on playing music. So, I can see some times, ahead, when we might not be the most active band. However, I just want us to keep plugging away. On a basic level, we love playing music with each other. That is what, I hope, will keep us going, and help us to keep finding ways to express ourselves. I'm actually not sure, at all, of â€˜how' we will progress as a band. I know that we'll always be playing what we think is good, what is fun, and what is meaningful to us. If that starts to come out sounding different from stuff we've done before, then so be it. If it means that Pete trades his guitar for a tuba, and Brendan switches to didgeridoo ... well, I'm all for it. I'll just grab a bongo, or something, and bang away. Scene Point Blank: What does the rest of 2006 hold for Sinaloa? Luke: Well, we seemed to have a lot of records come out last year, so now we will probably be taking some time to play around and make some noise. Out of that noise will eventually come some new songs, but we plan on taking our time, and enjoying the lack of any sort of deadline. I'd like to play more shows around Boston, and to try to do what we can to build on the most vibrant and good things going on around here. We'll just â€˜be', I guess, in 2006. Luke: I would love to have our band express, adequately, our experiences of life. If people can listen, and understand our experiences and the ideas that have come from those experiences, then I would hope that those people would, then, apply it to their own experience. Maybe they find something useful in what we're saying, or maybe not. Maybe they completely disagree with our ideas, but spend time thinking about why they disagree, and something good comes from that. I certainly don't think that the three of us can provide many answers to the world's problems, but I do think that the more people share their experiences, and their ideas, the more capable humanity is of understanding itself, and the environment it exists in. I'm all for more voices in the choir - even dissonant ones. And, we don't all really have to be singing the same song. Words by Neil on Oct. 16, 2010, 11:46 a.m.
Posted by Neil on Oct. 16, 2010, 11:46 a.m.